When Carp Were Almost "Uncatchable..."
I spent many hours there, watching my stick float waver in the current and dip to the run of a gudgeon. Gradually I became aware of other species, - roach that flashed like meteors in the boat channel and chub with scales like a cheese grater’s victim. I fished for both with some success. Above me the glass cone would threaten eruptions but manage only smoke. I fancied that it was a volcano and, one day, the canal, the factory and all would be buried like Pompeii. It dominated the landscape, especially when viewed from the inflow where I fished. The glass cone did not tolerate indifference. Built of red brick, always its shadow was on the water. It was not a typical carp venue, this Midlands canal; but without it the fish I so longed to catch would have belonged to the rural haunts of a boy’s imagination, and to place my quarry in the murk of an industrial “cut” would have seemed almost sacrilegious. However, I was soon walking home from school along the towpath, treading as stealthily as my creaky leather shoes would allow and scanning the placid surface for the meanderings of a cruising common. The origin of those carp remained a mystery. Perhaps they had swum down from a canal reservoir, several miles and many locks away. It is more likely that they were poured one midnight into the oily margins by a misguided fisherman and concealed for seasons only by their diminutive size, until at last the pound was their dominion and they were the mightiest fish that swam its length. Even so, they had to work hard to survive. They would pother in the silts for scarce bloodworm and caddis and nose-dive the rushes for a trickle of snails. Small boys, armed with floats and maggots, pursued these fish in the summer holidays. Crudely-presented offerings were hurled at noses and tails and, soon enough, even most adults agreed that these carp were uncatchable. My own methods were equally unsuccessful, but I had my chances. Once, a common carp, of ten pounds or so, snatched the anchored crust that was my bait and ran with it. Line snickered from my spool and, closing the bail-arm and striking, I expected lively resistance. The fish did judder but the Mustad Kirby hook failed to bite home, and a vortex marked the spot of this encounter. When the first frosts murdered the algae and turned the water crystal clear, the carp would cease their regular patrols. I would watch their bronzed, immobile forms as they lay by shrivelled reeds, like statues of the summer fish they were. However, one Christmas, I forsook the pleasures of cold turkey and trifle for a few snatched hours of fishing at the inflow. The current here ran lukewarm from the flames of the glass furnaces. A few months earlier, I had observed a sizeable eel while it buried itself in the silt base, where the water would run tepid on its slumber. Here, surely, was the spot to fool a winter carp? Creeping down from underneath the bridge, I noticed four fish. There were three commons and a mirror and they hovered in the gentle current, pectorals beating, as tendrils of weed and whitened twigs whirled by. I was sure they were looking for food, and I would not disappoint them. Quickly squeezing a gobbet of flake onto the shank of the hook, I held my breath and dropped the bait into the streaming, foamy water and let it drift down. The bread trundled past the four fish, apparently unregarded. But a common turned and followed the flake and I knew a take was imminent. I watched pale lips fold over my offering and the fish bolted downstream, as if it knew it had made a mistake. The line sliced through foam and I struck. I fully expected to hear the scream of the clutch, but it was not to be. I did not even connect and the detached flake rose, hookless, to the surface. Another year was drawing to its close and I had failed, once more, to catch a glass cone carp. However, this was the pattern I had come to expect. However, returning home from university, several years later, I found myself, one late afternoon, setting up a rod and strolling the half-mile or so to the scene of my earlier frustration and failures. The carp were still there, and yet I was almost surprised when the familiar dun backs and dorsal fins broke the placed surface and the fish wavered unsteadily towards my floating crust. In those nervous few seconds, as two carp neared my bait, I found I could not concentrate on the matter at hand. I stared at the glass cone with its patina of amber moss. Then, with the same peculiar fascination, I noticed the swallows as they turned on elliptical wings to skim the green water. The largest of the pair rose but, at the final moment, the fish seemed to shudder and rolled away. A slightly westerly carried my crust closer to the bulrushes. Rain began to fall and more minutes passed. Suddenly, a mini-whirlpool surrounded my crust and down went the bread. The carp kited downstream as the rod took on its full battle curve. I applied steady finger pressure to the spinning rim of the spool but was mindful of the 6lb Bayer Perlon line. There were a few tense moments, and once the line snag out with sudden tautness as my adversary found an impressive reserve of strength and sheared away from the net, in a flurry of spray and white foam. But the outcome was never really in doubt and there it lay, this gaunt, unlovely mirror that, on the scales, was found to weigh only 7lbs 4oz. Its sparse scales were pale and ragged at the edges. However, as I returned her on that rainy afternoon, I realised that my carp possessed the untempered dignity of a true wild creature. The grime, the submerged masonry, the broken glass and scarring air-gun had marked my fish as surely as the attack of an otter or a heron. And so it was, with more than a faint sense of satisfaction, I left the canal to the fading light. Shortly afterwards, the pound was drained for minor repairs. The bottom was revealed as a lunarscape of ancient rubbles, bric-a-brac, rubbish and throwaways. In the boat channel, the meagre trickle of water that remained held only gudgeon in its deeper pockets. What remained of the carp I could not discover. This is an abridged and revised version of an article by Gary Bills that appeared in Coarse Angler, February 1989. 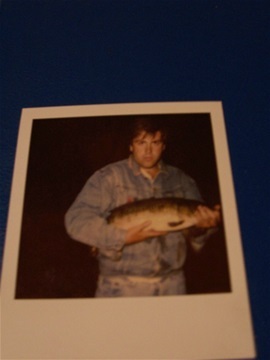 Picture - the youthful Gnome with another, unweighed canal carp, caught some years after the Glass Cone Carp. A good article,fished the canal many times and seen many hugh monsters glide by and as my heart starts to race I`ve often thought what and where do you eat? No doubt about it, the canal carp were tricky - they did not rely on angler's baits, and so we could be well ignored. Many thanks, Ian, that is very kind of you.